Teeth whitening improves the color of teeth, which have been affected by staining or medical conditions causing discoloration. There are many different ways that teeth whitening is achieved. Although you can purchase teeth whitening kits over the counter, some of these products can do long term damage to the teeth. If you are not happy with the color of your teeth, you can receive teeth whitening treatment from your dentist at Kyle Parkway Dentistry. Your dentist is qualified to assess your needs and decide on the safest, most effective treatment for you. While we want you to feel confident in your smile, your oral health is important to us. As part of our cosmetic dentistry treatments at Kyle Parkway Dentistry, we can provide professional teeth whitening to restore your smile, while protecting your teeth. Opalescence is a tooth whitening technology which literally gets to the root of discoloration. Not only will Opalescence remove surface staining, this whitening agent will penetrate the enamel of the teeth and eliminate off-colored molecules from inside the tooth. The technology uses the discolored molecules to actually whiten the tooth, as the oxygen from the Opalescence gel reacts with those molecules. The result is that the entire tooth is whitened rather than the superficial whitening of the tooth’s surface. 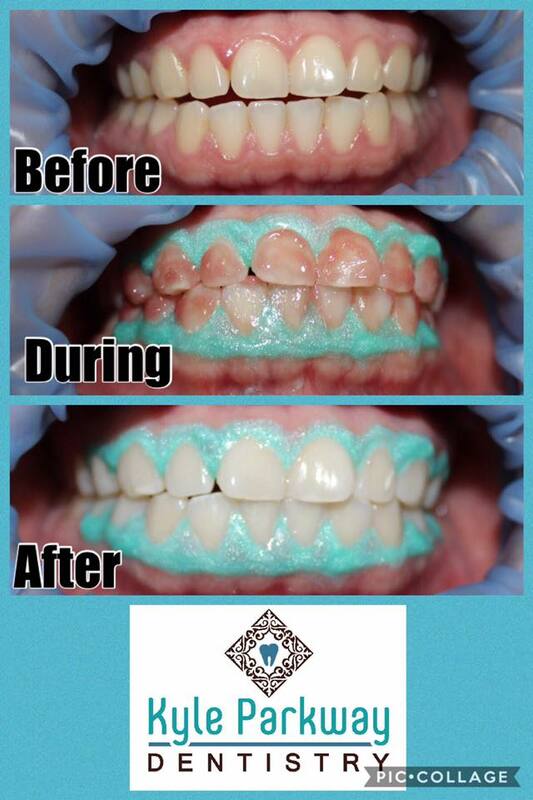 Kyle Parkway Dentistry is licensed to provide teeth whitening using the full range of Opalescence treatments. We can provide you with treatment at our practice or provide you with the gels and tools you need to carry out treatment at home. In certain cases, staining might be too deep inside teeth structure to whiten it with whitening products and our dentist might recommended alternate treatments such as veneers, crowns etc. Contact our office today for an appointment and for more details on what might be best options for you.